Our community dental clinic provides quality dental care to eligible people. Our community dental clinic offers dental care to eligible people. 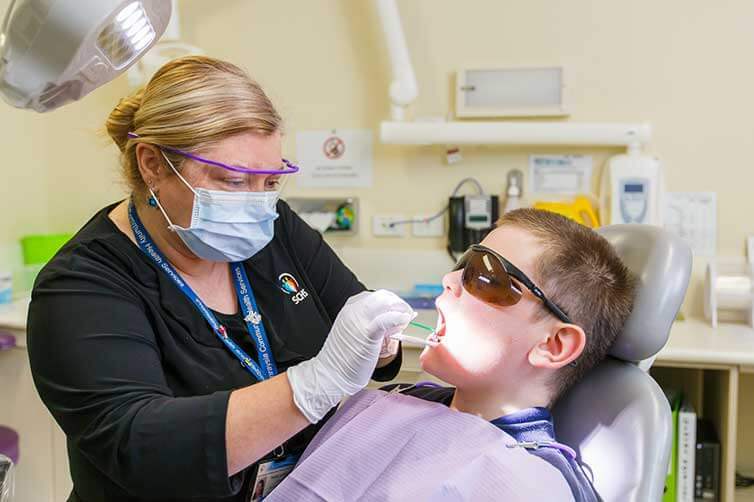 If you have a dental emergency (pain, bleeding or swelling) you may be asked to go to our “Sit and Wait” emergency clinic, held every weekday morning from 8.30am. The dentist will help you with your pain. If you require a general dental visit, you may need to put your name on the waiting list. General dental care may include regular dental check-ups, oral health advice, scale and cleaning, extractions, fillings, X-rays and fissure sealants. The Dental Clinic also has a denture service, both fixing and making new dentures for eligible clients. We offer clinical dental services to eligible people our community. We deliver oral health programs that aim to prevent oral disease and better oral health. Our community dental clinic offers clinical dental services to eligible persons. In addition to general dentistry, we deliver oral health programs that try to prevent oral disease and better oral health. Health care and pensioner concession cardholders. All children aged 0-12 years. Under 12 years of age: FREE (including non-concession card holders). Youth 12 to 17 years of age: FREE – Service only available to patients who hold a valid concession card or are a dependant of a concession card holder (i.e. parent’s Pension or Health Care Card . Adults 18 years of age and older: $28.50 – Must hold a valid concession card. Flat rate fee covers the emergency course of care only. Ongoing treatment will incur further charges in line with fees for general or conservative care. Under 12 years of age: Concession card holders and dependants of concession card holders are FREE. Non concession card holders are charged a flat fee capped at a family rate of four children per course of care. $33.50 per course of care (Capped at $134.00 per family). Youth 12 to 17 years of age: FREE for concession card holders and dependants of concession card holders. Adults 18 years of age and Older: $28.50 per visit, up to a maximum of $114.00 for a single course of care. Valid Health Care card or Pension card only. Available to all valid concession card holders (and dependants of concession card holders if it relates to a child 0-17 years). Fee depends on prosthetic requirements, but is capped at $137.00 for a full upper and lower acrylic denture.